The news would have us believe that we are living on earth at a time of high carbon dioxide levels. And it’s true — carbon dioxide levels have been rising since the industrial age, quickly enough to suggest that the effect is human-derived and we may be about to destroy this world for ourselves. But life has existed at much, much higher carbon dioxide levels. Right now, carbon dioxide is about 400 ppm (parts per million) in the atmosphere; 60 million years ago, it was at 3500 ppm. There is fossil evidence for a loss of atmospheric carbon dioxide through the Cretaceous period (145-65 million years ago), and scientists have long suspected that the evolution of the angiosperms, or flowering plants, could provide more evidence. The word “angiosperm” derives from Greek, meaning “enclosed seed” referring to the flesh surrounding their seeds, i.e. they produce fruit. The first fossil evidence for angiosperms is pollen from around 130-140 mya (million years ago), and they diversified rapidly in the mid-Cretaceous period, about 100 mya. 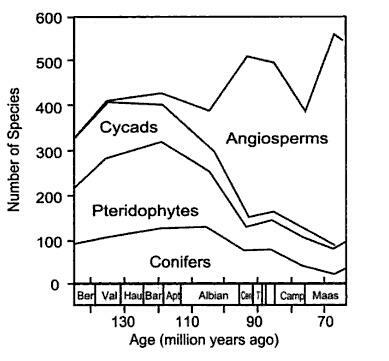 As you can see from the below figure, spanning time through the entire Cretaceous period, angiosperms really took off, increasing in number and dominating other plant types. (Pteridophytes are ferns; Conifers are cone-bearers such as pines; Cycads are something else!) Their complete take-over is evident at 80 mya. Angiosperms have an advantage because they are more productive — that is, they go through photosynthesis more efficiently, allowing them to grow faster and more effectively compete for resources. There are many aspects of their biology that could affect this rate: greater food and nutrient import by their roots, or greater water flow through the plant, greater nutrient flow, greater ability to absorb carbon dioxide. The question is: which one of these features was the causal change that allowed angiosperms to take over the world? Drs. 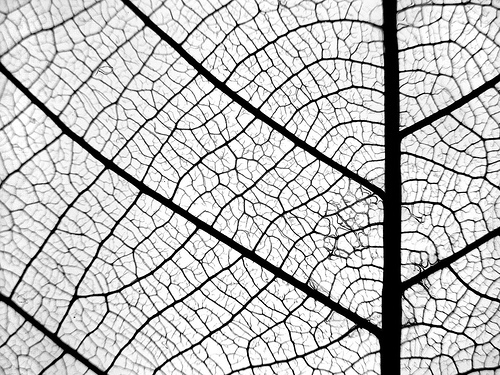 Brodribb and Feild believe they have found the answer: leaf veins, as published in the early edition of Ecology Letters (doi: 10.1111/j.1461-0248.2009.01410.x). They argue that leaf veins are a proxy for greater photosynthetic capacity, via greater gas exchange capacity. While the veins in a leaf typically carry water, each vein opens to the air through a hole in the leaf (stoma, pl. stomata), through which both water and carbon dioxide enter. In a world of decreasing carbon dioxide, the leaf would need to keep their stomata open longer or develop more of them in order to absorb enough carbon dioxide from the air to maintain their growth rate. However, the longer you keep your stomata open, the more water you lose. In order to keep them open to absorb carbon dioxide but also maintain hydration, the authors argue that the plants evolved more complicated leaf venation systems, to deliver water throughout the leaf more efficiently. Thus we can use the density of these veins to track the evolution of carbon dioxide uptake of angiosperms. The authors looked at 759 different plant species total: 504 living angiosperms, 89 extinct non-angiosperms, and 166 living non-angiosperms (for comparison). They modeled the phylogeny (evolutionary tree) of the samples from two well-supported “backbone topologies,” which they consider to be conservative estimates of plant evolution. They saw a pattern of increased vein density as each of these plants species evolved, but no change in non-angiosperms, demonstrating angiosperm-specific evolution. The authors then assigned photosynthetic rates to 35 species for which they had evolutionary data using modern leaf samples. These data showed that, under today’s atmospheric conditions, the plants which evolved later had higher photosynthetic capacities, suggesting directional evolution towards greater photosynthesis in an atmosphere with lower carbon dioxide. The non-angiosperm data once again showed no change, demonstrating that they did not go through a similar evolutionary revolution, which perhaps let the angiosperms take over. Often, in order for a great evolutionary leap, an organism needs some sort of pressure, or hard-times. For an organism like a plant that consumes carbon dioxide and sunlight, life 100 mya would have been great times — too much carbon dioxide and sun, and a warm climate, removing the necessity for any sort of winter-time adaptations. Plenty of resources to go around. Even low-efficiency parts were able to keep the plants alive with ease, so there was no need to evolve more sophisticated photosynthetic machinery. My question: would a gradual change in carbon dioxide result in the drastic evolutionary changes which Brodribb and Feild have shown? I looked into the carbon dioxide record for the Cretaceous period and discovered a potential cause for these changes: oceanic anoxic events. Oceanic anoxic events (OAE) were periods of great climatic upheaval, caused by overproduction. In a hot, carbon dioxide-rich environment, plants went through periods of drastic growth, accumulating organic carbon which then was unable to decompose. In effect, this sequestered large amounts of carbon, decreasing the amount of carbon dioxide in the atmosphere. The most severe OAE I know of, and thus a good example, is the Azolla Event (Brinkhuis et al. 2006, doi:10.1038/nature04692). About 50 million years ago, there was a dramatic drop in carbon dioxide levels from 3500 ppm to below 1000 ppm. (See Pearson 2000 for carbon dioxide reconstructions for 60 million years ago. doi:10.1038/35021000) In the Arctic Ocean during this time, there were huge blooms of the aquatic fern, Azolla, which absorbed incredible amounts of carbon dioxide from the atmosphere during photosynthesis and sequestered it on the bottom of the ocean when it died and sank. (Anoxic soil conditions kept the plant matter from decomposing and re-releasing the trapped carbon, instead fossilizing, giving us evidence that this event occurred at all.) This event was a major cause of the drop in carbon dioxide and temperature during and since the Eocene. Smaller versions of the Azolla Event occurred throughout the Cretaceous. These events lasted less than a million years – just a drop of time in the large scale, but the loss of carbon dioxide for a million years can create great evolutionary pressure on organims. Below is a figure showing three different reconstructions of carbon dioxide levels during the Cretaceous period, the scale in relation to current carbon dioxide concentrations. The solid line (Berner 1994, American Journal of Science, link) and dashed line (Berner and Kothalva 2001, doi:10.2475/ajs.301.2.182) show similar, downward trends in carbon dioxide levels throughout the Cretaceous. 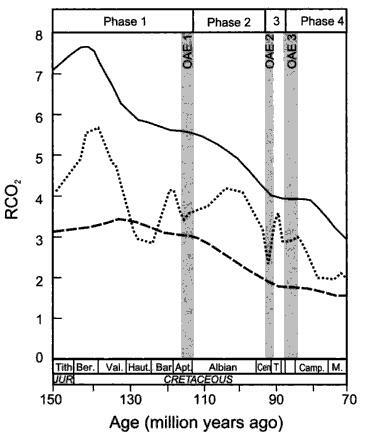 I’m more interested in the dotted line (Tajika 1999, doi:10.1046/j.1440-1738.1999.00238.x), which takes into account these OAE, evidenced by high-carbon black shale. During each of the estimated times for these OAE, there is a drastic drop in carbon dioxide levels, after which it rises back up to similar levels as previously, while the total trend is downward. The estimated times for oceanic anoxic events align well with estimated times for angiosperm diversification and expansion. The first OAE, around 115 mya, immediately preceded angiosperm diversification, while the second and third precede clear angiosperm dominance, as seen in the first figure. These oceanic anoxic events, with their severe but temporary drops in atmospheric carbon dioxide, would provide pressure to cause swift evolution in angiosperms toward a higher photosynthetic rate, as Brodribb and Feild showed in their paper. The alternation during the Cretaceous period between these carbon dioxide droughts and high levels of carbon dioxide from volcanic activity stemmed from tectonic movement from the breakup of Pangea, would give plants cause to evolve these new mechanisms, but also allow them to reap the benefits during times of carbon dioxide wealth and spread rapidly. To me, Brodribb and Feild’s paper doesn’t suggest that the change in leaf vein density caused the evolution and spread of angiosperms. This incredible evolution was simply a reaction to the changing carbon dioxide in the environment. This adaptation allowed them to grow and diversify much more efficiently than non-angiosperms, but I would be surprised if it were the only one. I’d be interested to know how other carbon dioxide-related mechanisms in plants evolved over time, and if they were also developed to cope with changing atmospheric conditions. Besides being fascinating, studying evolution in relation to climate change is pertinent right now. If we can learn more about how plants and other organisms have reacted to changing atmospheric conditions in the past, we could have more information to predict how they will involve in the face of human-induced climate change. A lot of science can be incredibly forward-thinking, which is why some scientists blow-off detailed studies of evolution. But biology is all patterns; the more we can learn about its history, the more tools we have to study modern biology and predict the future. good day! i just wanted to ask if you’re saying that leaf venation is not the cause of angiosperm evolution, then is it possible that evolution of angiosperms caused the changes in leaf venation?